MDspots has been connecting employers with physicians online since 2003. Nearly 35,000 active job postings in over 100 healthcare specialties (permanent and locum tenens). Over 13,000 physicians are registered on the website and seeking employment. Industry leading provider launches major updates and enhancements to the online job posting/job search platform. 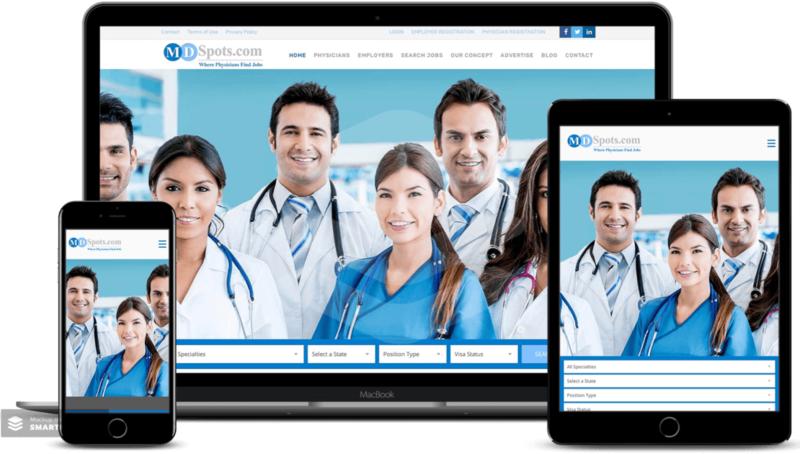 Wellington, Florida (10/30/2018) – MDSpots.com, one of the leading online platforms for connecting physicians and employers, announces major updates to its online presence. The new platform has enhanced functionality and allows both employers and physicians to conveniently access and navigate the website from both mobile devices and standard desktop browsers. MDSpots.com offers employers and recruiters a flexible and cost effective platform to post job postings, attract candidates and search our extensive database of physician CV and profiles. Physician members are actively seeking employment. Flexible membership options available. New cost-effective membership for employers and recruiters allows users to post up to 100 jobs per month for as low as $199/mo. Include your company logo and bio with your job postings and increase visibility with available banner advertising. Employers and recruiters receive same day email notifications when a new physician lead registers on the website. Modify your job postings at any time and enhanced search capabilities allow for efficient resume searches by medical specialty and location. View traffic on your job postings and receive Physician CV/Profiles from interested physicians. MDSpots.com provides physicians free access to some nearly 35,000 active job postings. Post your resume and easily apply for job posting and have employers/recruiters contact you directly. Free CV and profile postings, make updates at anytime. Fast, unlimited and flexible searches of nearly 35,000 job postings. Physicians receive regular emails notifying them of new and current job openings in their specialty. Exclusively MD and DO Opportunities eliminates the need to search multiple sites and journals. Leverage job postings to enhance your personal network of recruiter contacts. MDSpots.com is an online platform dedicated to connecting employers to physicians. With nearly 35,000 active job postings in over 100 healthcare specialties, MDSpots.com is a leading source for both employers and physicians.